The CIPWasher ™ has been upgraded to the 2011 version of their CIPWasher™ to celebrate our 50th Year. 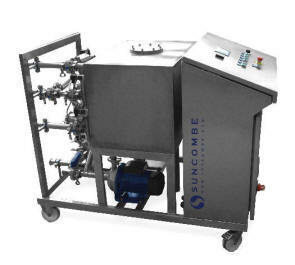 The CIPWasher ™ is an entry level CIP system which provides the ability to CIP pipes, tank, hoses and heat exchangers. The CIPWasher™ operates in a similar manner to a high pressure washer. High pressure washers are ideal for many cleaning applications, but have problems with cleaning in small enclosed spaces such as pipework, hoses, tanks and heat exchangers. To correctly clean this type of equipment the principles of CIP (cleaning in place system) need to be adopted. CIP works on higher flowrates, lower pressures and normally recirculated cleaning. The CIPWasher™ is a hybrid washer bringing the portability advantages of a high pressure washer with the ability to apply the cleaning principles of a CIP skid. Larger producers with widely spread out equipment.